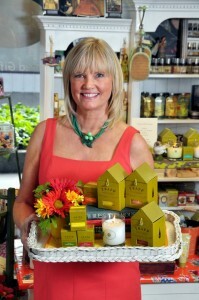 Hello, I’m Debbie McCormick, owner of Sunnyside Cottage. Opening my store was something I’ve dreamed about for many years. Having worked part time in retail since 1975 I’ve had plenty of time to think about the kind of store I would like to create before opening in March of 2004.I’ve always been interested in nostalgia. As a teenager I started a scrapbook of Norman Rockwell pictures. My favorite book was The Boxcar Children a story about orphaned siblings that made a home for themselves in an abandoned train boxcar. Sing along with Mitch was a family affair and I just loved singing old songs with my mom and sisters. (Remember “Follow the bouncing ball”). We also loved to sing along with the Lennon Sisters. Other happy memories include Sheriff John, Romper Room, I Love Lucy, Roy Rogers and Dale Evans, Bazooka bubble gum, Sugar Daddies, Pogo Sticks, hopscotch, jacks, Saturday matinees, board games, comics books, Chatty Cathy and many more happy thoughts than I can name here. I love it when a customers asks for an item that I hadn’t thought about since I was a girl. It usually sends me on a hunt to see if that item is still being made. Whether it was selling lemonade, personalized greeting cards or Girl Scout Cookies, I caught the entrepreneurial bug at an early age. With my love of the “Happy Days” it’s not surprising that I chose to start a Vintage inspired gift, home décor and toy store. Creating happy memories for others in a feel good place to shop is my mission.